Soldering tools for Mobile Cell Phone Repairing are of different types – soldering iron, soldering station, desoldering tool, desoldering station, soldering pencil, hot air system, hot air pencil, SMD rework system, BGA rework system, SMT equipments, Wave soldering machine, reflow oven and many more. These soldering tools can be used in large scale electronics manufacturing in a factory or small rework and repair jobs in a service centre or R&D house. 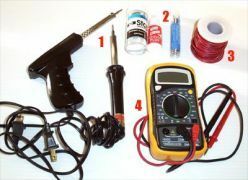 How to choose the right tools for soldering, and how to use them properly depends upon the type of soldering you are going to do. If you want a soldering tool for manufacturing will need a good quality temperature controlled soldering station. If you want a soldering tool for repairing work, you may need a good quality soldering iron. SMD / SMT tools and equipments are need when you are doing Surface Mount Soldering. Apart from soldering tools, you also need soldering consumables such as solder wire, flux, solder paste, desoldering wick etc. Quality of solder joint and life of the PCB depends upon the quality of soldering consumables used and the technique used in the soldering process. Soldering stations and soldering iron are the most commonly use soldering tools used for hand soldering of PCB. While a good quality soldering station can be used in manufacturing and repairing / rework, a soldering iron is normally used in repair work. Weller and Hakko are the leading manufacturers and suppliers of all kinds of soldering tools and equipments around the world. ic desoldering karne par nikal hi nahi rahi. Solder paste lagaya. Hot air gun ka use kiya par Ic nikal nahi rahi.Kya Kare?